In a match that went down to the final bout to be decided, the Fairmont Wrestling Firebirds lost a heartbreaker to Loveland in the State Duals Regional on Saturday. With a slightly depleted lineup manned by some JV wrestlers, the Firebirds battled to the very end. The Firebirds won 6 of the 11 contested bouts. 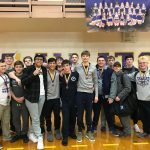 Coed Varsity Wrestling · Jan 26 JV 3RD AT BUTLER TOURNAMENT – MACHADO AND LUCAS ARE CHAMPS! 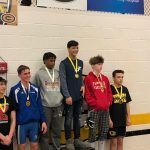 Coed Varsity Wrestling · Jan 20 THOMPSON A CHAMP AT BUCKEYE CLASSIC! The Freshmen Wrestling Firebirds competed at the Centerville Buckeye Classic over the weekend and had 3 placewinners. Leading the Firebirds was 145 pound tournament champion Evan Thompson, who went 3-0 with 3 pins. Braeden Denlinger finished as the runner-up at 285 while Johnathan Rivera finished 6th at 170. 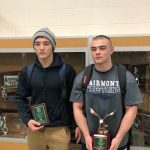 Coed Varsity Wrestling · Jan 20 SNODGRASS A CHAMP AND OVERHOLSER 5TH AT MAUMEE BAY!